Joey Logano started the Pure Michigan 400 on the pole on Sunday after setting a track-record mark of 203.949 miles per hour on Friday. He finished the race right where he started, but this time he led the field to the checkered flag. Mark Martin, 54, appeared ready to add to his overall success at Michigan International Speedway and become the oldest NASCAR Sprint Cup Series winner at the track. But Logano chased him down over the last few laps before getting by Martin. Kevin Harvick was right behind the battle for the lead and was ready to take advantage of a mistake by any of the top two. He closed quickly and was able to get past Martin, but was not able to make a pass of Logano. Kurt Busch finished third in the Pure Michigan 400. Harvick had good intentions on the last restart of the race on lap 177 with just Martin in front of him but said he mistimed his restart. It was a weekend loaded with positives for Logano. He moved from 16th to 13th in the points with three more races remaining in the race the Chase where the 12 finalists in the points will compete for the Sprint Cup Series title. Logano became the 17th driver in MIS history to win from the pole and got the maximum number of points in not only capturing the race but leading the most laps. While still in the race for the last two wild card positions he’s now only six points behind Martin Truex, Jr., in 12th and 17 points behind Greg Biffle, currently in 10th. 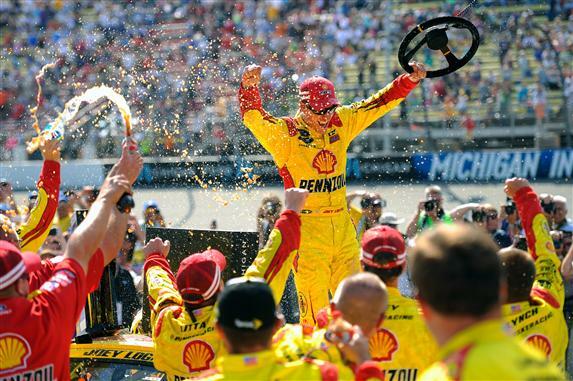 It was Logano’s first win this season and third in 170 NASCAR Sprint Cup races. Two of his three wins have now come from the pole. Jimmie Johnson, the current points leader, had to drop to the back after he crashed during practice on Saturday. He took the lead 44 laps into the race, but the engine in his backup car expired 10 laps later and his record at MIS fell to 0-24. Dale Earnhardt, Jr., was also among the race leaders who ran into troubles, finishing 36th after brushing the wall 65 laps from the finish when his right front tire failed. He led for a total of 20 laps.